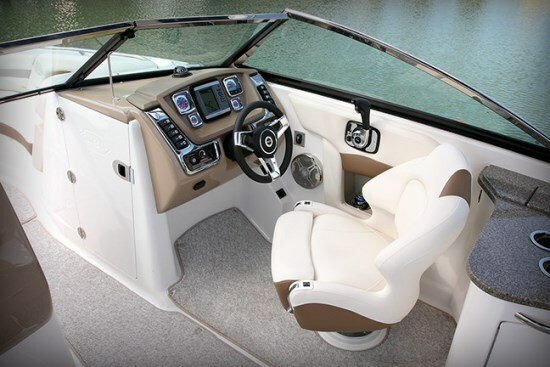 Chaparral Boats of Nashville, Georgia offers thirty models for 2013 in seven series of sportboats, sportdecks, tow boats, cruisers, and sport yachts from eighteen to forty-two feet. The Sunesta 264 subject of this review is one of four Sunesta Sportdeck models available from twenty-two to twenty-eight feet. The huge integrated swim platform on the Sunesta 264 is close to the water making your enjoyment of watersports activities of all kinds most easy and enjoyable. Hidden under a flush lid on the starboard side of this platform is a stainless steel telescoping boarding ladder and under a matching flush lid on the port side is a most handy built-in self-draining cooler to help facilitate your watersports enjoyment even more. 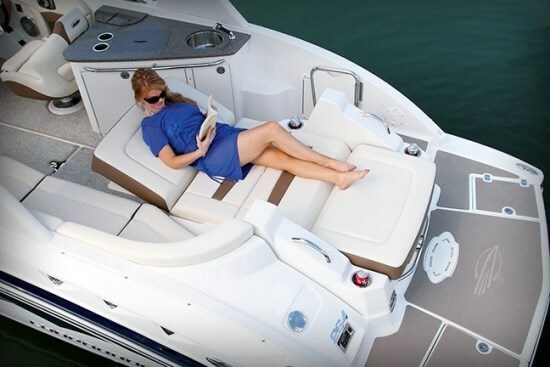 The rear-facing portion of a double-wide U-slide seat / reclining sunlounge lets you sit up or fully recline to relax or to watch or participate in the ongoing watersports activities available to this large swim platform. You may choose to upgrade the amenities of this platform area even further by choosing the optional Convenience Package which includes, among other items, a transom tilt switch and transom stereo remote. Pull-up cleats, available as a part of a Premium Package, are a handy and practical addition to the platform also. You can also choose what Chaparral calls a Logo Mat soft grippy covering for the platform which would also keep your bare feet cooler on those blistering hot sunny days. You can also go for a stainless steel transom shower which also includes a bow-mounted shower and perhaps you may also want the platform gas grill. Moving forward through the starboard side transom gate into the cockpit of the Sunesta 264, you’ll find a very spacious layout with lots of elbow room. 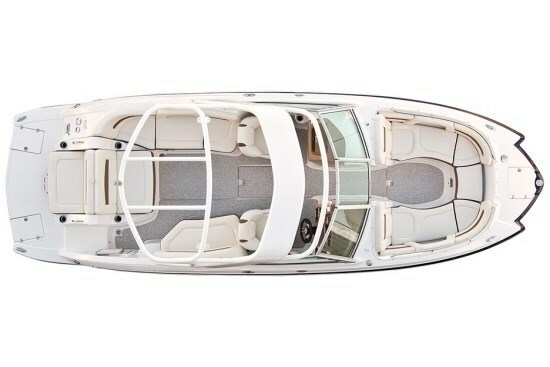 Standard seating includes a port side L-shaped lounge which extends across the transom as part of the aforementioned U-slide convertible seat/lounge. 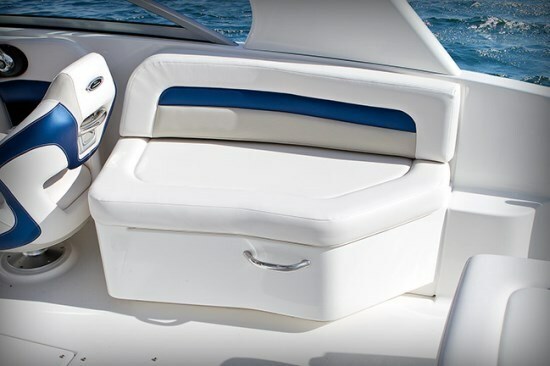 Standard on the starboard side is a bench seat with a built-in carry-on 54-quart portable cooler. Seat construction includes StarLite seat cushion bases with flow foam and premium vinyl upholstery with Nano-Block Technology™. Storage is found under most seat bases. If seating quantity is not a huge issue, you may wish to replace the starboard side bench seat with the optional cockpit wetbar cabinet. 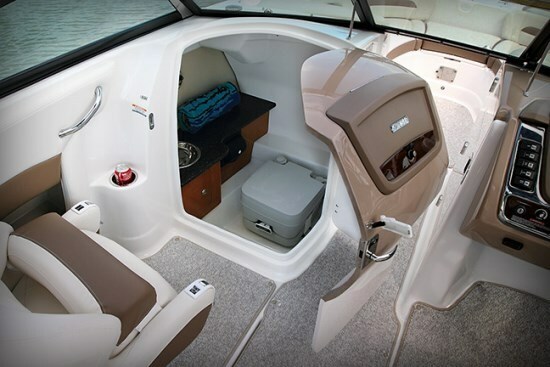 Additional storage is available in the large and wide in-floor compartment intended for waterskis, kneeboards, etc. Snap-in cockpit carpet is optionally available. A standard table with cupholders fits a side mount here in the cockpit or in the bow area. A Dura-Flex suspension bucket seat with flip-up bolster is provided at both driver and passenger helm consoles. On the driver’s side, the custom molded dash includes a polished spoke tilt steering wheel facing digital instrumentation with glass fog-resistant lenses and brushed aluminum faces with stainless steel bezels. A compass and digital depth sounder are standard. Garmin GPS and an upgraded leather wrapped steering wheel are optional. 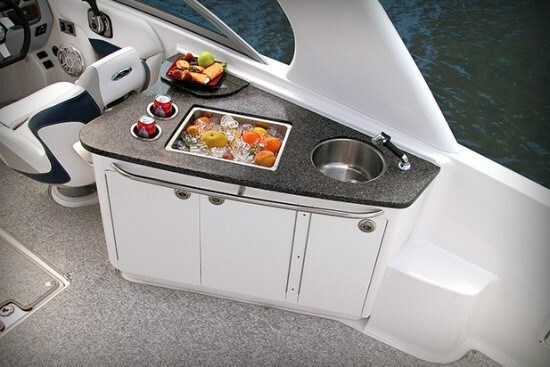 The passenger helm includes a glove box storage compartment plus a fibreglass-lined head compartment with lockable door, solid surface countertop, wood cabinet, stainless steel sink and faucet, opening portlight, and porta potti all standard. Teak and holly flooring and a Vacuflush toilet are available. Forward through the opening centre section of the standard aluminum-framed windshield and standard bow doors there is plenty of elbow and leg room and comfortable seating with twin forward-facing contoured lounge seats with full height backrests. Storage is found under all of the seating and beneath the very forward seat is a handy built-in self-draining cooler. Up on the bow is a standard anchor locker with flush lid and a concealed stainless steel telescoping ladder for forward beach access. 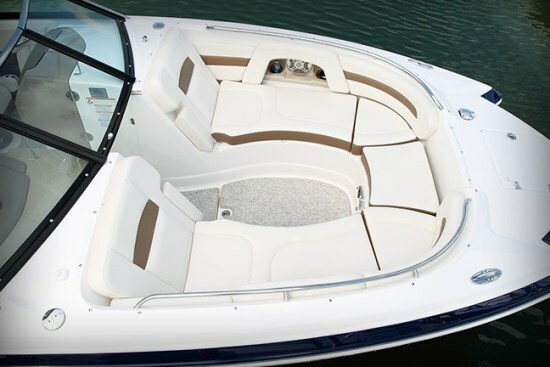 Power for the Sunesta 264 is your choice of single MerCruiser or Volvo V-8 sterndrive from 300 to 380 horsepower with Bravo III or Duo-Prop drives respectively. Standard canvas includes a colour-coordinated bimini top with windscreen and you have the choice of optional canvas attachments. However, you may wish instead to go for the snazzy optional hinged aluminum custom arch in either black or white with bimini included. Other options you may consider include dual batteries, automatic fire extinguishing system, bow filler cushion, and a premium sound system instead of the standard AM/FM/CD with MP3 jack, remote control and Sirius Satellite compatible.